Which Team In Euro 2016 Has The Best Strikers ? Euro 2016 is just couple of months away and after all participating teams playing couple of friendly in march we can assess all teams chances and how they are weighing up going into the big competition this summer. We will be taking a look at tournament favourites and how the stack up upfront and in defense. So in the part of of Euro 2016 series we take a look at which european team is best equipped upfront. England surprised a few people with their come from behind win against world champions Germany in Berlin when goals from Harry Kane, Jamie Vardy and Dalle Ali earned a historic 3-2 win for England. Unlike the previous few international tournaments, England set to have number of options upfront with inform strikers Vardy, Harry Kane and Danny Welbeck certain to travel with English squad. Wayne Rooney is also likely to be fit before the Euros while Hodgson has to make a call between Sturridge and Theo Walcott. So the last couple of months in Premier League are very important for forward position hopefuls in England squad. 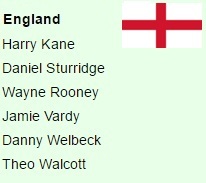 Preferred Strikers: Harry Kane and Wayne Rooney to start upfront with Danny Welbeck used on the wings. While Jamie Vardy is likely to be used as impact sub. If Daniel Sturridge show some form and remain fit for remainder of the season he might also be picked in the squad. Diego Costa is likely to play upfront on his own with a packed midfield in Spain squad. But they do have several quality alternatives and impact subs with the likes of Aritz Aduriz, Alvaro Morata and Paco Alcacer. Aritz Aduriz has scored 31 goals from Bilbao this season in all competitions at the age of 35 and he will be a great story if given a chance to lead the line for Spain. Preferred strike-Force: Alvaro Morata is likely to play on the left wing while Valencia’s talented striker Paco Alcacer will be used as impact sub. 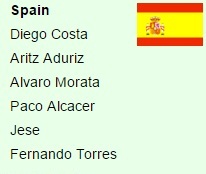 Spain might also take Fernando Torres with the national squad but its hard to see him getting much of the action. Probably the most talented strike force in Euro 2016 with the likes of Anthony Martial, Antoine Griezmann, Alexandre Lacazette, Andre-Pierre Gignac and Karim Benzema if picked makes up devastating attacking options for hosts France. Didier Deschamps is spoiled for choice and France are early tournament favourites playing at home. Preferred Strike force: There is a big question mark over Karim Benzema’s inclusion in the squad but if he does get picked we are likely to see Benzema, Griezmann starting upfront while Martial deployed at the wings. 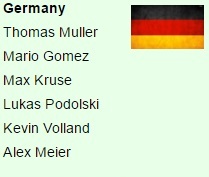 Number of options upfront with usualy suspects of Thomas Muller and Mario Gomez likely to take forward roles while Max Kruse, Lukas Podolski, Kevin Volland and Max Mayers are other names who might play some part. Joachim Loew prefers Mario Gomez with Muller playing behind him in no.10 role. Podolski might not be taken to the Euros while Kevin Volland has been scoring goals from fun in Bundesliga and might be used a a sub. Southampton’s Graziano Pelle is the only inform recognized striker available for Italy while couple of other options like Sampdoria’s Eder who scored 12 goals this season for Sampdoria before moving to Inter Milan in January. Juventus striker Simone Zaza is another name might be considered for attacking role upfront. One of the two Ciro Immobile or Mario Balotelli are other options available to Antonio Conte. 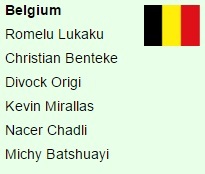 Another highly rated side, Belgium have quality strikers in their ranks headed by premier league most inform forward in Romelu Lukaku who is a prefered options upfront while Liverpool duo of Christian Benteke and Origi makes good squad players. Kevin Mirallas and Nacer Chadli are other two names who might feature from time to time. 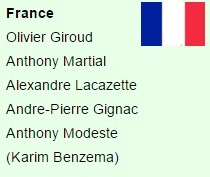 I feel like France has such quality and versatality upfront which makes them the best attacking team in the euros. Germans duo of Muller and Gomez are very efficient while Vardy and Kane might turn out to be surprise packages this year. So which of these Euro 2016 favourtis boost the best strike force ? Let me know your thoughts by commenting below in box.